Wear a light violet satin sheath dress and you'll look chic anywhere anytime. Sam Edelman Danna Pointy Toe Pump from Nordstrom are a stylish complement for your look. One of the coolest ways to style a grey coat is to pair it with black leather leggings. To give your overall outfit a more elegant aesthetic, add a pair of Sam Edelman Danna Pointy Toe Pump to the mix. This combo of a white blazer and black skinny pants will cement your outfit coordination skills even on lazy days. For extra fashion points, add Sam Edelman Danna Pointy Toe Pump from Nordstrom to the equation. Exhibit your outfit coordination credentials in this laid-back pairing of a black crew-neck sweater and a black lace midi skirt. Hesitant about how to finish off? Introduce Sam Edelman silver leather pumps to your ensemble to kick up the style factor. Who said you can't make a stylish statement with a laid-back look? You can do so with ease in a white cropped top and a pink pleated midi skirt. A pair of Sam Edelman Danna Pointy Toe Pump immediately bumps up the oomph factor of your ensemble. This ensemble with a silver lace sheath dress isn't a hard one to pull off and easy to adapt. A pair of Sam Edelman silver leather pumps serves as the glue that will bring this look together. The mix-and-match capabilities of a black leather biker jacket and black floral skinny pants mean you'll have them on permanent rotation in your closet. And if you wish to effortlesslly perk up this ensemble with footwear, why not complement this outfit with a pair of Sam Edelman Danna Pointy Toe Pump? Make a navy jumpsuit your outfit choice for a laid-back look with a modern finish. 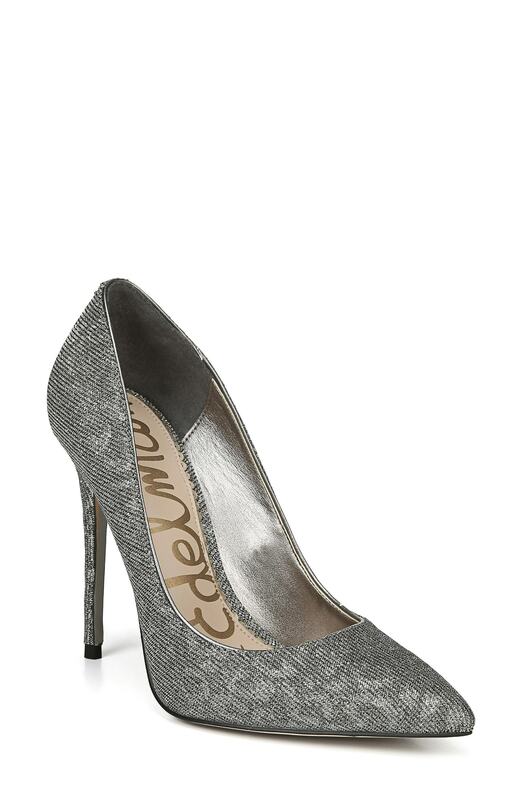 A pair of silver leather pumps instantly ramps up the glam factor of any outfit. For an outfit that's pared-down but can be flaunted in a myriad of different ways, make blue ripped skinny jeans your outfit choice. Rounding off with Sam Edelman Danna Pointy Toe Pump is an effortless way to inject an extra dose of style into your look.